Ahh, the third story of the Hawthorne siblings. 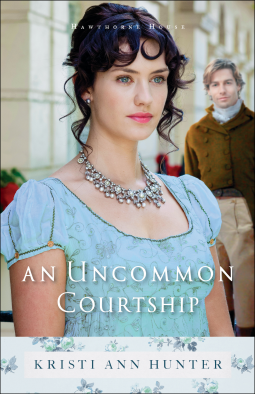 This one is about Lord Trent and his new wife, and I enjoyed it as much as the other two books! (An Uncommon Courtship can be read alone, but it is better if you've read the other books and understand the other characters). I just love a good Regency and reading about all the manners and customs of the times. A lady's reputation was held in such high esteem then...so very hard to imagine today! Because of this belief, Lord Trent finds himself in a situation that can only be rectified by marriage. From the other books, I guess I got the impression that Trent was a bit spoiled and selfish, but he really isn't. I liked him a lot and thought he was the perfect guy for Adelaide. And, poor Adelaide. How disheartening to come from a family like her's! What a great comparison to show the strong family ties that the Hawthornes have! Such fierce love and protection was foreign...then welcome...to Adelaide. I think everyone hopes for a close family like the Hawthornes! An Uncommon Courtship is a story of a gentle, lasting love that can come despite difficult circumstances. I loved it, and am so looking forward to Kristi's next book...it has to be about Griffith! I can't wait to see who is good enough for the duke! *NOTE: I would not recommend this book for unmarried young ladies. Some of the physical interactions (though between a married couple) were more descriptive than I would allow my daughter to read. Moms, use your own judgment! Thank you to Kristi Ann and Bethany House for sending me a copy to read and review!